The overture to Weber’s opera Oberon (tr. 1) makes a great curtain-raiser. Tennstedt is attentive to its every mood and to the economy with which the worlds of delicacy and verve contact and coexist. First there’s the evocative opening with Oberon’s magic horn solos answered by muted violins, intense streaks of viola and cello, carefree flecks of flute and clarinet, a delicate fairy march at 1:29 before violas and cellos begin sketching a theme of utter contentment at 2:03. Crash at 2:49, that spell is broken, and we’re into the first theme proper which is dashing in both senses, an Allegro con fuoco, and fire is something Tennstedt could never be accused of lacking. Neither is contrast, as those horn calls return and the second theme at 4:08 on clarinet is the full version of what the violas and cellos started earlier, treated expansively as if wishing to stay in the moment as long as possible. But this extension itself contains from 4:53 a vivacious tail which is to provide, after a rigorous development from 6:01, an irrepressibly high kicking close from 7:53, played here with great fervour. 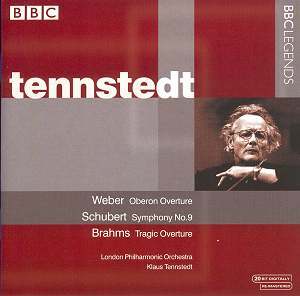 This is the second LPO/Tennstedt performance of this overture to appear on BBC Legends. I compared the first (BBCL 41582) which comes from a 1990 Prom in a recording with more body and glow in the Royal Albert Hall acoustic. The account overall is slightly slower, the actual performance time without applause being 9:40 against 1984’s 9:05. The introduction is a touch smoother and more reflective but misses the edge of the earlier account and the appealing quality of its violas and cellos’ theme sketch. The 1990 strings show plenty of verve in the Allegro and at the end of the overture their playing is more shiningly stylish, with firmer dynamic contrasts, but the 1984 strings are more gutsy and prominent in relation to the brass, so the whole effect is more dynamic. The 1990 second theme has become still more expansive, almost to the point of torpor, whereas in 1984 it still has some shape. Also its extension on first appearance in 1984 still has some gentleness where in 1990 it’s a bundle of zest from the start. As a performance I prefer this 1984 account. Next the main event, Schubert’s Great C major symphony. The opening horns’ theme has an engaging directness of expression. Tennstedt provides a steady view of unfolding events with momentum ever present even in the Andante introduction. Schubert’s accents on the first beat of the bar, so one accented note is followed by two unaccented, are well observed without being overstressed, as is the closing 3 note softer phrase as echo (tr. 2 0:23). This gives the whole a clear shape and lilting progress which is maintained in the clean-cut flow of the presentations by woodwind (0:29), the violas and cellos’ expansion (0:52) and then a new tone of resilient grandeur with the trombones’ first contribution (1:26) which alternates with the litheness and flexibility of the first oboe’s delivery from 1:53. When the woodwind have the theme again, over triplet figures in the violins, for the first time without the accents (2:56), Tennstedt creates a sudden feeling of freedom which is an appropriate preparation for the slow crescendo launch into the exciting, jubilant trombones’ sforzandi, sudden strongly accented chords from 3:35, catapulting us into the energetic and festive first theme and exposition (3:40). The rather more skipping second theme (4:30) makes a cool contrast in its first appearance in E minor but Tennstedt still gives it plenty of swing. The trombones prove significant again in the episode from 5:34 in which they present a motif based on the horns’ theme which gathers in dynamism like an animal determined to break out and also prove the telling feature in the eruption of the following crescendo, especially in the recapitulation after the brass’s fiery contributions to the development. There’s no exposition repeat, which would come at 6:26. The coda (11:25) is marked faster. Tennstedt takes it slightly faster so it’s exhilarating without being breathless and presents the return of the horns’ theme at 12:38 triumphantly with the trumpets boldly hammering out the triplet rhythm against it, only marginally held back when the strings grandly repeat it so the closing triplets on horns and trombones are emphatic without being stodgy. Schubert’s slow movement (tr. 3) is intriguingly full of shifts of focus, most plainly between dance and march, clearly presented by Tennstedt. The opening beguiling theme for oboe here belongs to the dance, with something of pertness about it and then coyness in the decrescendo from 0:27, then racier when joined by clarinet at 0:34 with trill added. And on the end at 0:47 is an altogether homelier wisp of a theme, hardly established before a crashing chord signals the orchestra’s determination to champion the march elements of the opening theme, sprucely engaged here. The second theme proper (3:04) brings a contrasting gentleness like a landscape coming into flower, a kind of more meditative match for the mood evoked by that earlier wisp of a theme. It too has an orchestral march in tow and, more memorably, a series of horn calls (5:02) which Schumann said were like “some heavenly visitant quietly stealing through the orchestra”. When the opening theme returns at 5:32 it’s made more dance like through the graceful elaboration of the first violins’ accompaniment, realized with a lovely lightness of touch here. But the orchestral march also intensifies to a stark, stonily gazing climax and stunned silence at 8:32. Then a theme for cellos, also derived from part of the opening theme, a consolatory response which seems the most mature and humane of all. Yet loud and soft sonorities, brusque and solicitous manners continue to the end. Tennstedt scrupulously presents the ambiguities and doesn’t take sides. To the third movement scherzo (tr. 4) Tennstedt brings vigour in the strings, chattering fun in the woodwind and brass ballast. He enjoys a waltz springing out of the opening theme at 0:24 with great ease and flexibility and, in the second section which finds the oboes and clarinets sounding really rustic, another, rather more wistful waltz at 1:59. The trio features the grandest and most extended waltz. Though not so marked, Tennstedt takes this slightly slower, thereby securing a glowing full tone and joy in shaping the melody. As ever there’s plenty of orchestral detail to relish, such as the double basses crescendo at 6:21 as they slide down to give a little boost to the final and quietest, most reflective return of the theme, sensitively realized here. In both scherzo and trio first section repeats are made but not second section repeats. Freshness, flair and festivity abound in Tennstedt’s finale (tr. 5) which is a true Allegro vivace. Here’s all the spontaneity of live performance writ large. The violins in particular have their work cut out in their accompanying triplets yet respond with feathery finesse. The second theme (1:40), the one beginning with 4 identical notes, Ds on the first appearance, is finely articulated with accents neatly pointed and contains near its end (1:58) a phrase derived from Beethoven’s Ode to joy in his Ninth Symphony. That this is a deliberate homage is confirmed in a longer quote (3:55), creamily delivered by the clarinets here, at the beginning of the development and then transformed in an eerie strings’ tremolando before trombones provide the first of the sturdy brass treatments of the 4 identical notes at 4:45 which are to become really stomping Cs from strings, horns and bassoons at 10:43 in the coda for whose beginning (9:52) Tennstedt finds an equally telling hushed quality. To the final chord Tennstedt follows old edition practice of applying an accent and then diminuendo where the 2002 Barenreiter Urtext marks only a sforzando accent. As in the first movement there’s no exposition repeat, which would come at 3:55. I compared the ‘studio’ recording Tennstedt made in 1983 with the Berlin Philharmonic (EMI CDZ 4795162, no longer available). Here are the comparative timings, the bracketed one for 1984 being the actual music time before applause. The fundamentals of interpretation are the same but there are some differences. The generally slightly slower speeds of the earlier version I’d say are owing to being able to consider tempi more meticulously through recording playback facility. This results in greater uniformity but arguably less spontaneity. The introduction of the first movement is a case in point. The Berlin Philharmonic version is smoother but the London Philharmonic has more character in its greater individuality of phrasing and attention to accents. On the other hand the Berlin Phil Allegro has more magisterial vigour and seamless flow, with the entire movement now one great surge. Tennstedt’s handling of Schubert’s long crescendi is equally exciting in both accounts, but the greater dynamic range and weight of the EMI recording make a more spectacular effect. The London Phil coda is more contrasted in tempo and, if the return of the horns’ theme is better balanced in Berlin, London’s closing triplets are snappier. I prefer the LPO second movement. It’s more active, ‘in the moment’ than the BPO’s more beautifully crafted nature. So the LPO wisp of a theme is more notable and expressive as a meditation aside. Their first violins’ accompaniment of the opening theme’s return is more delicate, the cellos’ theme in response to a tenser climax more expressive, the return of the second theme has a balmier flow and the strings’ decoration is more pleasingly kept subservient. The BPO account has more marked dynamic contrasts and a climax of epic proportions which thereby becomes too stagy. I also prefer the LPO scherzo because the texture is more transparent, the woodwind have a fresher, more open air quality and that freshness extends to the strings in the waltz themes. The BPO are smoother and suaver and more is made of the long crescendi in the scherzo but there’s less sheer expressiveness in the quieter moments, like the second waltz theme of the scherzo, where the LPO strings are sheenier and a trio in which the LPO woodwind are given the space to play more expressively. The more fiery BPO finale, with greater dynamic contrasts, is less easy to live with than the homelier festivity of the LPO whose crescendi are still sufficiently exciting. The BPO violins’ triplets skitter smoothly but are less feathery than the LPO. There’s a more infectious momentum about the LPO performance, especially the way the second theme swings more with the span of the melody. Its trombones are heard to more thrilling effect in the exposition’s climax from 3:08. The LPO homage to Beethoven is sweeter, even if the closing stomping isn’t as massive as the BPO’s. This disc ends with Brahms Tragic Overture (tr. 6). Tennstedt’s opening has a heroic, Spartan striving quality, the marked sforzandi notable in the first loud passage for full orchestra (0:20). Here’s a steely gaze and progress in D minor, a sense of endeavour in times of crisis with uncompromising proceeding onward. The second theme (3:03) has warmth and affection but an equally passionate resolve. The development (6:08) is a mysterious meditation only to gather strength to face up to the necessary action. The heroism of this is honoured in the warm version of the essence of the opening theme provided briefly by horns and trombones as a recapitulation in D major at 9:36 against sympathetically slowly descending first violins. The reprise of the second theme on violas at 9:59 is still warmer and more fluent. But the opening chords return at 12:08 and the steeliness takes on an added urgency as the tragedy plays out with only a briefly honouring lament from the clarinets at 13:00. I compared the Berlin Philharmonic/Herbert von Karajan ‘studio’ recording made 2 months earlier (DG 4496012). This has a more de luxe upholstered sound but the early sforzandi are less biting than Tennstedt’s. Karajan’s strings in the climactic passages are more rhetorical. I preferred Tennstedt’s greater grit. Karajan makes the passages of calm creamier and the second theme gentler. His development is a thing of beauty of repose in itself as well as the transitional phase that Tennstedt emphasises. This accounts for Karajan being a little slower overall, 14:36 against Tennstedt’s 13:44 performance time before applause. Tennstedt’s development has more character, at first a sweet meditation but consistently infused with a sense of progression. With Karajan you’re more aware of the overture’s structure, with Tennstedt you feel it more as an ongoing experience. Tennstedt’s recapitulation has just a little more burgeoning glow. Karajan’s second theme reprise is comparatively reflective and his conclusion more scintillant than steely. In sum, Tennstedt’s is the more gripping, dramatic interpretation. These BBC recordings have decent clarity which doesn’t match the vibrancy of the performances. But fittingly the symphony’s comes out brightest and best. My abiding impression of this disc is one of zest and vibrancy, also the ability to draw out expressive playing, factors more significant than having state-of-the-art recording.